Tuck and Ginger are two cats who get on each other's nerves. But they need to pause the claws if they’re to escape from the high-rise apartment where they are trapped. 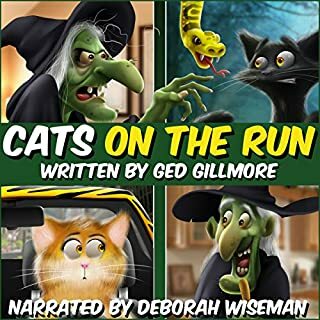 And escape they must, for their kidnappers – Rodney and Janice Burringo – are warty wicked witches who want to use Tuck and Ginger’s body parts to build the best witches’ cat in the world: a black Purrari. wait till you get to the part with the snake, honestly, I was laughing so hard I was crying. one day I'll grow up but until then I'll keep reading these...Um...to my grandkids of course! Seriously funny book as entertaining for adults as it is for kids. 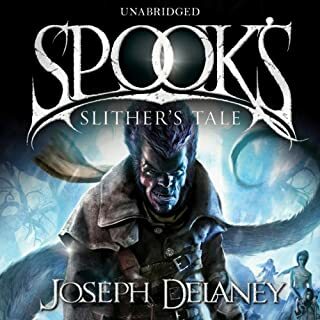 Far from the Wardstone, a new darkness is rising . . .Slither is a haizda mage who preys upon humans, drinking their blood to feed his dark urges. So when a local farmer dies, it’s only natural that Slither should want to feast on his lovely daughters.But then the farmer offers him a deal, and extracts from Slither a promise that will take him on a journey to the City of the Petrified Tree, to a fallen star-stone that holds great power, and straight into the path of Grimalkin, the Witch Assassin. I really enjoyed this although it is far darker than anything I would normally read. This entire series is like that though. You can't stop listening once you start. They are that good. I think they are too dark for kids though. And this one is the darkest of the lot. An amazingly well-crafted story but it was boring. 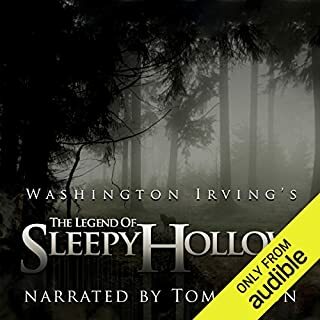 The first few chapters were amazing, I was so excited to have found the book when I started listening, but then the entire story took a turn and began at his childhood. I found the entire university thing tedious and couldn't help but think of Harry Potter, which I also didn't like and couldn't get past the letters pouring through the door in the first chapter, and the writer's devices became predictable. Kvoth would get into trouble, usually brought on by his own actions or smuggery, it would look like he was going to fail, then some amazing act of will, or luck or skill or chance would save him. Every. Time. As hard as I tried, I could not warm to the main character, or any of the characters, despite how well rounded and thought out they were. They were just boring, pompous, obnoxious people...all of them. I didn't love to hate Ambrose or hate to love Kvoth. They were both boring as each other. I didn't even like Kvoth's parents and I usually always like people's mothers. I really wanted to know what the story is with the Chandrian (spelling?) 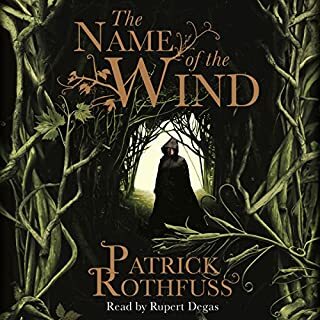 and the scraylings (sorry, I have to see a word to remember how to spell it) that were in the first part of the book, and that, the excellent, poetic writing and the awesome narration can almost make me persevere long enough to find out...almost. But I honestly don't think I can listen to any more of Kvoth's melodrama, especially not 94 chapters of it, and what sounded like a heap of the author's own opinions about church clergy and bankers, since every character thought the same on the topic, and which were mostly cliche and unoriginal. A very frustrating experience. The writing is so perfect, it alone is worth a listen just to experience it. I just wish it told a meatier story or kept to the meatier story it began with. But, tonnes of people have given this book awesome reviews and it really deserves them. I just found the story boring, eventually predictable and full of unmemorable characters. The writing itself and narration, though... masterful. The story was just not to my tastes. 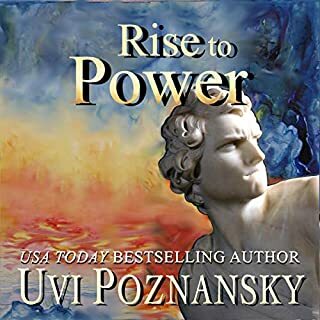 I have tried twice to listen to this book. When I started listening to it the second time, I was like, why did I stop the first time? This is really good, apart from the fact that I found a combat nurse from the 1940s using a baby voice when she spoke to be unrealistic....well, outright annoying is probably apter, but the rest of the book was engrossing. The history, the detail, the sheer scope of the story was just amazing. Then I hit chapter 32 and it's all gone downhill. Now I remember why I stopped reading it. The entire melodrama of Lallybroch (sp? ), Jamie, his sister Jennie, her husband Ian and baby talking Claire was so boring, parts of it were even repulsive. Like when Jennie has her swollen feet in her brother's lap and is telling everyone what it's like to be pregnant and is touching herself up as she does so. The author says words to the effect that if ever there was a witch, it was Jenny, basically, because her description had them all entranced. Well, it didn't entrance, me, it was really off-putting and pretty gross. And then I swear the equivalent of a chapter was spent in a "Jenny is as stubborn as her brother, her stubbornness was matched only by her brother, who could possibly be as stubborn as her brother? Only Jamie could match Jennie for stubbornness" match. *Groan* I nearly started whacking myself in the head with my kindle. In the end, I had to jump 5 chapters and I never jump chapters. 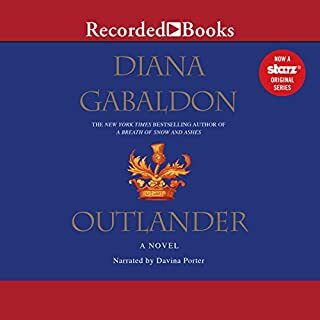 So I just skimmed through the chapters and it was more of the same old same old, throw in a few repetitive and gratuitous 'love' scenes that really, after reading about for ten chapters get a bit old, until I found a place with some Redcoats, watches and action again. I'm seriously hoping this book finishes as interestingly as it started but I'm not holding my breath. The narrator is great, even with the men's voices but come on...a 1940s combat nurse talking like a baby and throwing tantrums instead of well, acting like an adult? I get that she was confused but even when she wasn't confused, that infuriating voice continued. 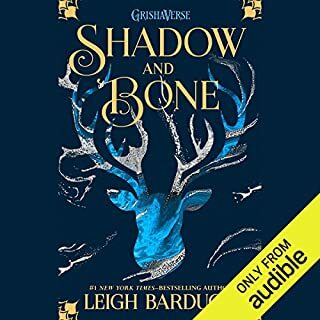 I'm probably not the best person to review a book like this since I usually go for action/fantasy books. The 'historical' tag drew me in though so... yeah. I would recommend this book for people who like historical romances and fully understand what the term means. That way, maybe they won't be surprised at how boring the story gets from chapters 32-36 (so far) Meh, maybe people who like this kind of story like saggy, pointless middles. This one simply isn't for me. 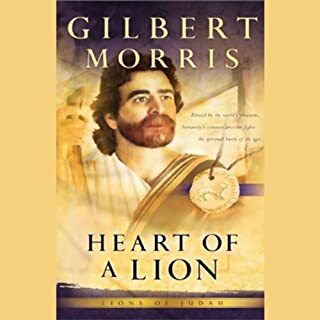 If you're looking for uplifting, biblical fiction, this book isn't for you. 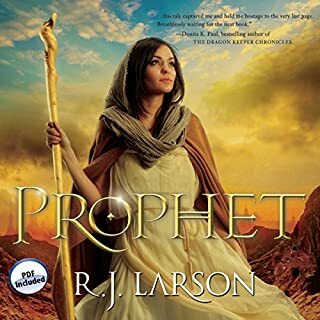 It's kind of humorous in places and sometimes clever, but I think that's more due to the skill of the narrator than the actual story. If I'd been looking for comedy or biblical parody, I would have given this book more stars. As it is, I feel quite misled. It starts with gratuitous bad language and ends with gratuitous innuendo, both of which I don't think belong in biblical fiction. I don't know what category this belongs under, but it definitely wasn't what I expected it would be. Maybe it would deserve more stars if it was listed under the comedy section. The narrator however, 10 stars. He at least got me to the end, but I won't be buying anymore in this series. I really enjoyed this story from start to finish. It covered about every emotion from love to despair. I thought it was really clever how the author wound God's work around every thing that happened. It's almost like a romance between God and mankind. It's a fascinating book, I loved it. This book is so good I bought the kindle version so that I could read it. Usually, I'd just rather listen to the audio but this was so good I didn't want to waste a single word. The plot was just amazing and the story so good that I could keep listening when I had to do something, I've never read anything like it. It kind of starts on a story arc, shifts to another one for ages, then shifts back to the first. It's like reading a Celtic knot and it's completely engrossing. Not a boring page among it. I've been lucky to find some awesome books this year but this is definitely my favourite. I haven't looked yet, but fingers crossed, the second book will be available. 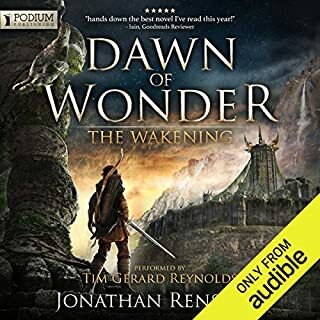 I'd recommend this book to anyone who likes fantasy and who is looking for something original... even if they didn't like fantasy I'd still recommend it. It is so convincing in its detail (without there ever being a single information dump, no joke!) and the characters are so well thought out, that it doesn't read like the usual fantasy. It's like, the world in the book is real and you are reading about how real people respond to some really unusual things. Then there's political intrigue, betrayal, heartbreak, hope and more surprises than you can poke a stick at. Sometimes I actually really did laugh out loud or smile. It's amazing. A wonder. Yep, definitely. Get this book.